I secured some stock funds thanks to Starbucks and bought…some of the number one rated beer on BeerAdvocate.com. That is right, I invested in Heady Topper—three 4-packs to be precise. Now, I know what you are thinking: investing in beer? Well, put it this way: when this beer is delivered it sells out within an hour, so it stands to reason that it is worth the investment. Besides, it is only delivered around Burlington and I very rarely have the chance to get down there on delivery days. Other than that we only spent $10 this week, leaving us with $32 for the end of the month. The conference is at the end of January, but nothing has been finalized yet; so we will let you know more when we have concrete details. With Thanksgiving arriving this coming week Katie and I have participated in an annual tradition of adopting a turkey. 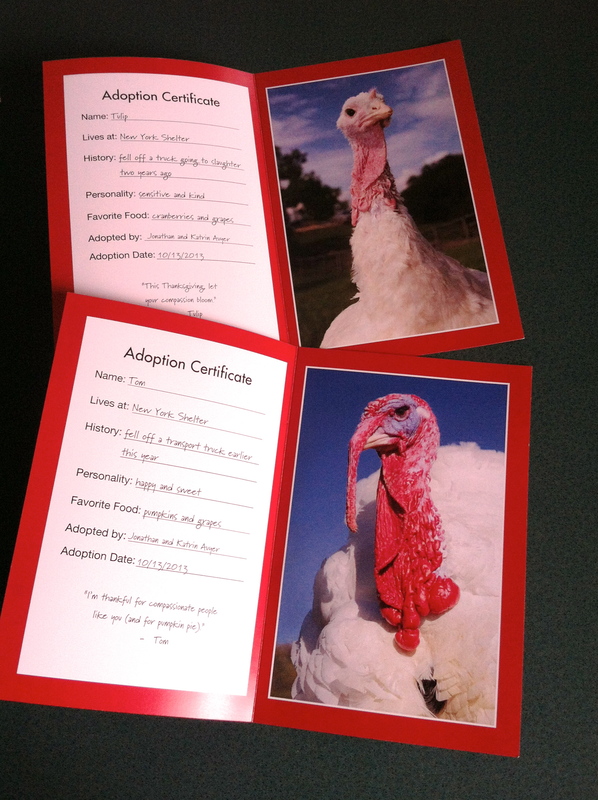 This year, however, we didn’t want to adopt just one turkey, we adopted two: this year’s adoptees are Tulip and Tom. We really love helping to adopt these turkeys—they are special and intelligent creatures and donating some funds to ensure that they can continue to live out there lives in peace and comfort is an honor. We also wish that more people would see how unique these creatures are and would give giving up meat a chance. We wish all of you the best Thanksgiving. May it be spent with family and friends and may you truly have a relaxing and satiating holiday!